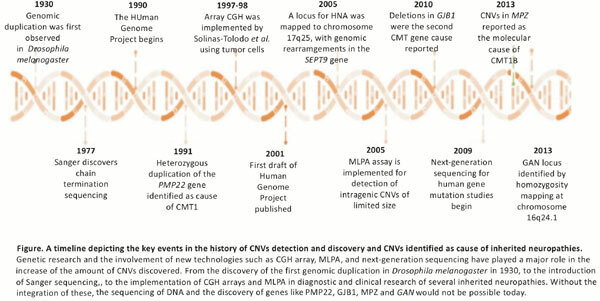 The rapid development in the last 10-15 years of microarray technologies, such as oligonucleotide array Comparative Genomic Hybridization (CGH) and Single Nucleotide Polymorphisms (SNP) genotyping array, has improved the identification of fine chromosomal structural variants, ranging in length from kilobases (kb) to megabases (Mb), as an important cause of genetic differences among healthy individuals and also as disease-susceptibility and/or disease-causing factors. Structural genomic variations due to unbalanced chromosomal rearrangements are known as Copy-Number Variants (CNVs) and these include variably sized deletions, duplications, triplications and translocations. CNVs can significantly contribute to human diseases and rearrangements in several dosagesensitive genes have been identified as an important causative mechanism in the molecular aetiology of Charcot-Marie-Tooth (CMT) disease and of several CMT-related disorders, a group of inherited neuropathies with a broad range of clinical phenotypes, inheritance patterns and causative genes. Duplications or deletions of the dosage-sensitive gene PMP22 mapped to chromosome 17p12 represent the most frequent causes of CMT type 1A and Hereditary Neuropathy with liability to Pressure Palsies (HNPP), respectively. Additionally, CNVs have been identified in patients with other CMT types (e.g., CMT1X, CMT1B, CMT4D) and different hereditary poly- (e.g., giant axonal neuropathy) and focal- (e.g., hereditary neuralgic amyotrophy) neuropathies, supporting the notion of hereditary peripheral nerve diseases as possible genomic disorders and making crucial the identification of fine chromosomal rearrangements in the molecular assessment of such patients. Notably, the application of advanced computational tools in the analysis of Next-Generation Sequencing (NGS) data has emerged in recent years as a powerful technique for identifying a genome-wide scale complex structural variants (e.g., as the ones resulted from balanced rearrangements) and also smaller pathogenic (intragenic) CNVs that often remain beyond the detection limit of most conventional genomic microarray analyses; in the context of inherited neuropathies where more than 70 disease-causing genes have been identified to date, NGS and particularly Whole-Genome Sequencing (WGS) hold the potential to reduce the number of genomic assays required per patient to reach a diagnosis, analyzing with a single test all the Single Nucleotide Variants (SNVs) and CNVs in the genes possibly implicated in this heterogeneous group of disorders. Copy number variants, Structural variations, Inherited peripheral neuropathies, Charcot marie tooth, Array analysis, Whole genome sequencing.